This page is dedicated to sorting out an alleged Alawi (Alawite) segment of the victims of the pivotal Houla Massacre of May 25, 2012. For context, the primarily Sunni Muslim opposition blames Alawite militias loyal to the Alawite president Bashar Al-Assad, and claim the victims were all Sunnis. The allegation is therefore quite significant to understanding what really happened that day. Pro-government sources, in garbled form via German journalist Rainer Hermann, told of a "Shomaliya" family of Alawi faith killed somewhere in al-Houla on May 25. 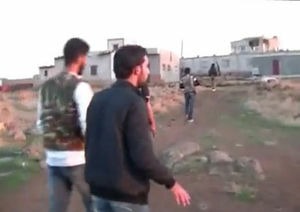 Other reports mention an Alawite village near Houla stricken that day, or sometime later, named al-Shumariya/Shumariyeh. At least ten victims from at least two families, religion not given but including women and children, were reported. This clarification was the basis of this page, while the village's location remained unclear. More recently, a separate town came to our attention, and while it's on Talk:Houla Victims: Shumariyeh/Shomaliya#the talk page, the rest hasn't been updated yet. This is a ways south of Houla, across lake Homs, and nearest to the border town and rebel hotbed al-Quseir. Syrian official sources say the May 25 attack was launched partly from Quseir, which only makese sense for a town in this region. At some point, rebels took over this whole town, which was only taken back by government forces in May, 2013 (see link for details). Considering the clarified distinction that this is a separate massacre launched on the same day as the one in Houla, a Shumariyeh Massacre page is in order and planned. Until then, the page below and the discussion page contain about everything that will be re-organized there. One sub-set of the alleged victims of the Houla massacre remains rather mysterious. The crime scenes, names, death tolls, and more, are at least there for the Al-Sayed families (agreed by all to be Sunnis, but of contested loyalty) and for the Abdul Razaq family (allegedly both Sunni and recent converts to mainline Shi'ism, not Alawi'ism). There are of course conflicting versions of all these, but there are at least records to compare. German journalist Rainer Hermann's "opposition" sources added an apparent wrinkle, however, telling him (as translated from his German to English) "also killed were members of the Alawi family Shomaliya." He passed this on in his June 8 article questioning the accepted version of events. There was no further explanation, but one other alleged witness, anonymous resident of Kafr Laha, quoted in the Catholic-run Vox Clamantis, supported it. the rebel attackers established themselves that night in "the southern district" of Taldou and there "massacred Alawite families," plural form,"men, women, and children," before burning their homes and trucking their bodies to their brigade mosque in the north of town. He seems to be drawing on second-hand information, actually, but that doesn't mean it's invalid information, just subject to all the problems of second-hand, and translated, accounts like this. On May 29: "Syria`s Ministry of Foreign Affairs and Expatriates condemned in the strongest terms the crimes committed by foreign-funded armed terrorist groups in Taldao and al-Shoumarieh a couple of days ago." On May 30: "The massacre in Houla late last week was committed by armed terrorist groups, Syrian Ambassador to Russia Riyad Haddad has said. [...] According to the diplomat, the armed men first opened fire on combat infantry vehicles, killing 31 servicemen, and then went into the villages of Shumaria and Houla. None of these mention anything about Alawites killed, but the government in generally, at first, said nothing sectarian - only that armed opposition killed law enforcement and civilians. The hospital, already known as allegedly attacked and torched, is in the area generally called the city of Taldou, if on its southern edge. It's right across the street from one of the Al-Sayed massacre sites (the southern one) on Main Street (see graphic below). If this is seen by some as a separate village, it could mean each of the southern "fingers" is its own place. Or maybe Main street south of the arches, outside the old city gate, is arguably its own village. Seen that way, is this other village as close as the one with the hospital? Al-Shumariyeh must be pretty near, pretty small, and otherwise considered part of Taldou. There are no nearby towns with that name, and even tiny Foulah,less than a mile distant, gets its own name on Google Maps. From a distance, looking at the map, there is one spot above others that looks like a possible village slightly apart, but still set within what would otherwise be called Taldou. This is the apparent location on Google Maps. The map at right puts the area in context. If this is it, the three stricken area line up east-to-west by whatever design, although using different north-south roads to get to each place. This one is on the same side-road as forward Army Base position also called the "Water Company," a small area that couldn't have been massively defended, although presumably it was the most solid position in town. Although it's not clear from the Google maps imagery, various videos confirm that the the Water Company base and the little cluster of buildings that might be Al-Shumeriyeh are on the high ground that surrounds at least southern Taldou (that's why, activists say, the Army did its shelling primarily from there). This is the same for the Shi'ite town Algur, a little further southeast, and for Foulah and the other Alawite villages southwest of town. It's said these areas are protected, by government checkpoints, from outside attack. This location would normally be protected by a forward army base, if a small one. Thus, it would also be perfectly accessible from the base, for any government forces intent on a false flag operation. But according to some, this position, along with all four of the others, had fallen to a small rebel army on the afternoon of the 25th. If that's the case, and if they wanted to attack that area, that evening would have been the best time. Other versions suggest the base remained in government hands, but was pinned down under attack from the north by rebels passing through the town in question from the other side. That's supported by an apparent rebel fighter filmed on the ridge in between, firing an RPG in the direction of the base at sunset. This scene is captured and explained in the video Shumeriyeh shooter. "the areas where the slaughtered families were uncovered"
Another, unusual, map (inset) was found at this post on the Greater Syria blog. Until we can get a reading on the labels, we can say the easternmost block, red, includes the village in question. 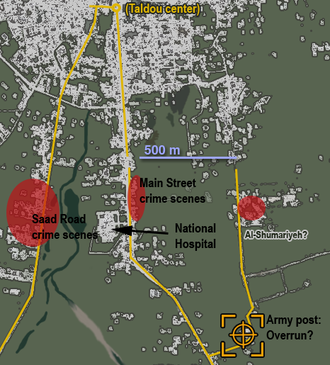 As a map of "the areas where the slaughtered families were uncovered," it's not clear who else it could mean but the Alawite victims; no other sources, to our knowledge, place any of the dead in this part of town, aside from soldiers and rebels killed in fighting at the water company base. The base itself is, however outside the red area, which includes only our possible Al-Shumeriyeh and the next most likely match just to its north (perhaps collectively these make up the Alawite village). There are no victims acknowledge by rebel sources from that area. The list includes Al-Sayeds on Main Street, Abdul Razaqs on Saad Road, and a few scattered others, plus Army "defectors." If any number of people (as "families" suggests) were killed in a related village, they weren't acknowledged that way. One possibility is that the victims from Al-Shumeriyeh, say there were 18 of them, were mixed into some other tally. There was an extra abundance of dead Abdulrazaqs, a reported 62, most or all from from the homes on Saad Street. One possibility,if a faint one, is that the victims from Al-Shumariya wre among those we saw, laundered into some expanded or wholly fabricated Abdulrazaq family. According to Syrian state sources, there are numbers and even names (apparently) attached to these victims. 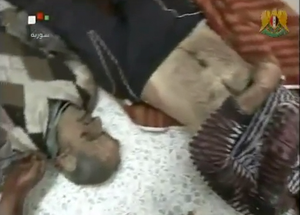 One video (channel unclear, possibly SANA, English version) reported on May 26 a "Terrorist Massacre against Two Families in al-Shoumariyeh Village in Homs," as the text description says (note slightly different spelling). The announcer describes as "related news" to the Taldou (Al-Sayed) massacre they knew of, "an armed terrorist group burned a number of house in Al-Shumeriyeh village in Homs countryside, committing the horrible massacre against the two families of Mohammed [Abu Nehi?] [Al-Binawi?] (phoenetic) Abdullah and his wife and his six children, and [Rata Velo?] and his son in the village." The names are spelled out properly in the SANA text report already cited: "a source in the province told SANA reporter that terrorist groups from al-Qaeda perpetrated two appalling massacres against families in al-Shumariyeh village ... the terrorists brutally killed Mohammad Abdul-Nabi Abdullah, his wife and six sons in addition to the citizen Rateb al-Oulo along with his son. There are at least three body arrays that stand out as possible matches with the Al-Shumeriyeh victims, one set or another, or both. Two other possible matches are shown in only one place yet known: a SANA video of May 27 also showing the more well-known victims left behind at Aref Al-Sayed's house. Like the Al-Sayed family, filmed by SANA May 26 and otherwise absent from activist videos of the night before, both of these sets of bodies might have been left behind by, or unavailable to, the opposition. If so, unlike the Al-Sayeds, the opposition never claimed them or arranged with the UN to have them handed over by the government forces ostensibly controlling the area. In fact, they were apparently never mentioned at all. One display of bodies is shown by SANA underlaying the description of the victims at Al-Shumeriyeh, where "the dangerous terrorist escalations also prevailed." The names rattled off are hard to make out, but sound pretty consistent with what we have. In the video here, at 6:25, adults predominate, and they're less arranged (few blankets), although not in their original places of death either (not enough blood). Four men of different ages, including one gray-haired man (Mr. Al-Oulo?) and a slightly older woman in black are shown. It's not clear who shot the footage, but it's very rare or non-existent in rebel postings. The number of adults seems to be a mismatch with the families outlined as dying there. The same video also features at 2:29 yet another scene, in a different spot, that could also be match - a man and a woman, partly shielding at least three young children, probably four of them or perhaps more, on two couches in a well-outfitted living room. The number isn't a clear and full match with the Abdullah family (both parents, six children), but again this unusual scene was shown with the bodies in situ by SANA, and never in opposition videos. It's laid over an explanation of the killings in Taldou, confusingly treated as separate from both Houla and Shumeriyeh. Wherever it is, the slogan painted on the bullet-scarred wall behind them (see inset) is of great interest. As explained on the Talk page, the phrase painted here seems to have a single best reading (not definitive, pieced together here by a few non-Arabic speakers): "من هنا مر لجيش الحرة". The top line seems to be a common phrase in rebel graffiti and slogans, roughly translating "from here over" (Google translate), usually seeming to mean from here on out, forever. The bottom line seems to say, most likely, Al-Jeesh Al-Hurrah, Free Army, common shorthand for the FSA. 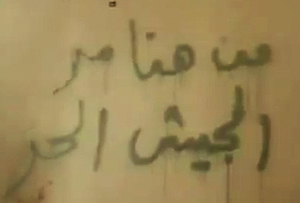 It cant' be known for certain who scrawled this message, but it apparently says "from here forward, Free (Syrian) Army." It could be arrogant rebel fighters as it literally reads, or Shabiha copying their call sign, as another rebel video at 2:19 alleges they did when attacking a pet store in August. Why would the Alawite Shabiha stray over to an Alawi family/village during their genocide against the Sunnis in Taldou? Of course that makes no sense, and explains why, if there was an attack there, it has been down-played and obscured by opposition-fed sources. Tony Badran derided the government claim that Al-Shumeriyeh "was attacked by 'armed gangs.'" But he followed that with an acknowledgment that this Alawite village was attacked, actually, by rebel forces. The sources saying that remain unclear at the moment, but they mention nothing about home invasions or massacring whole,families. This reprisal couldn't have happened long after the massacre; SANA was talking about an attack on Al-Shumariyeh on the 26th, just hours after the main massacre wrapped up late at night, about as the UN monitors arrived, the dead were buried, and as the Army was trying to re-gain control of their overrun posts. Including, perhaps, the one that would have allowed access to that little village we know so little about. While Badran can see the revenge part of this, being an Alawite village that could spawn Shabiha, the rebels also never specify the attack on May 25 came from this village itself. They point the finger to the southwest, never talking publicly about this place one way or the other. Months later, ostensibly on Sept. 14, some local activists and fighters, including one who helped remove bodies after the massacre, took an filmed expedition with star witness Ali Al-Sayed. They walk for over half of a kilometer (it's been mapped) down Main Street, behind or through the empty houses, to what he apparently claims to be his family's home - the same one the UN monitors filmed bodies still inside of on the 26th. Along the way, Ali's guardian (holding his hand) points to the southeast and explains something to him (3:58). The host then points straight to the little village across the fields (4:03), and explains something to the audience in Arabic and partly drowned out by wind). They pause here and a well-equipped fighter guy explains something, perhaps about that village. Assad and Shabiha might be mentioned (4:27), but nothing quite like Shumeriyeh is evidently spoken. 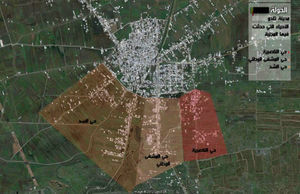 But that's clearly the little village identified above as likely site of another portion of the Houla massacre. A careful visual comparison shows we're seeing its eastern edge, its tallest central building, and some peripheral buildings closer to the camera (obscured in the graphic/map above). About a week after that little walk, on Sept. 22, the opposition SOHR reported "In Homs Province 7 civilians were killed," including "a man, when regime forces raided the Shumariya village." It seems rather unlikely the original inhabitant still lived there at the time (if this even refers to the same place). There is also a close-up view of the village in a very long opposition video of activist Jalal Abu Suleiman, "accompanied by elements of the battalion Martyr Mohammed Saheb Abu Omar of the Army in free Hulaa" (from the description, Google translated). They walk, at near-sunset on or before November 5, towards the water company base,across the fields from the north. They pass without pause through the village under study, by now seeming to be completely abandoned (see around 5:30-7:00, inset image from 5:26). ↑ Detailed Final death toll for Saturdayy 22/9/2012: Approximately 214 Syrians have been killed. This page was last edited on 3 October 2013, at 09:58.